Grammy award winning singer, songwriter, poet, and actress, Chrisette Michele, is On The Couch... again! In an exclusive interview, she dishes on her experiences thus far, her favorite products, styles, and future hair plans. The best part is that she answers YOUR questions! CN: How long has it been since your Big Chop? CM: It's been six months now. Did this Big Chop differ at all from your first two? It's totally different because now people have a lot more to say about natural hair, than when I did it the first time. In college, half of the brown skin girls had natural hair because we didn't feel like going to get perms and they cost too much money. But now that I'm older, it kind of means a lot more to wear my hair natural again. What are your must have products? Have these changed since you first BC'ed 6 months ago? It gets your hair so soft! I have very hard, angry curls, and they can feel like razor blades to my fingers unless I really treat them really, really, really nice. Oh, and the packaging of the Hair Milk is so cute! It looks like a little milk bottle, and it makes you feel happy when you're using it. You know what else is really good? Shu Uemura has a curly girls shampoo and conditioner. It's the kind of product you'd buy at like a Saks Fifth Avenue or Bergdorf Goodman, and I while I'd much prefer to use products that aren't fifty dollars a bottle, this stuff is the truth. My mom had some in her shower, and I totally stole it. The shampoo and conditioner makes your hair actually feel silky and curly. And yeah, and I don't have silky hair! What styles have you experimented with? Are you still the main person caring for your hair? I'm still the only person caring for it. And I've been doing a lot of comb twists lately. Before every photo shoot, I'll do a set of comb twists and then pull them apart right after makeup is done. So comb twists have become your staple style? Yeah, lately. My hair is now, a whole entire two inches… you can't tell because it shrinks to my head, but it is growing! Rocking short hair, do you find it necessary to 'doll up' your look? If so, what are your favorite accessories? I always have a pair of earrings on and for me, I like button earrings... big, fun ones. BCBG and Aldo have been really really kind in giving me big, juicy, delicious earrings. Oh, and of course red lips too! What are the plans for your hair this go round? I'm definitely going to grow it out... but I have no idea what I'm going to look like! I think I'm going to cut it into a shape where it's longer at the top and a little shorter on the sides. Oh, that's so cute! I love that! What about color? The color you have now is gorgeous! Is that natural? I like my natural dark brown color, and it gets a little reddish brown in the summer time when the sun hits it. I love how full it looks when it's dark. It's gorgeous dark. Your hair looks so luscious in the pictures I've seen lately. Thank you. I had to fight to get that color, everyone wanted me to keep it blond. When you color, what brand do you use? Color is such a touchy subject, because when you sit down at the salon, they're telling you what they think, and it's like this whole court, you know? Everybody has an opinion. Honestly, I really enjoy going to CVS and getting a box of whatever my stylist thinks is a good brand. But I'll tell you the truth, Dark and Lovely has been the easiest go-to hair box that I've ever used. I've been surprised, pleasantly surprised, because my hair has held up extremely well, maintained it's beautiful curl pattern, and hasn't broken off. Did you use box color for the blond as well? Tell us about your new album, Let Freedom Reign?! I was in church on a Friday night at a youth service, and one of my close friends, Anthony, was singing. He started free styling and the words that came out of his mouth were, 'let freedom reign.' Have you ever had an epiphany... when something just hits you and you don't know why? I really decided to just stay with those words, and let them guide me through this album. So, every song that you hear comes from a very free place. Especially the title track that is both political and emotional. It is definitely an album about letting freedom be the forefront of our decisions. CN Reader: Has your personal style been influenced by your natural journey? Actually, I've been able to express myself even better now because my hair doesn't take up so much space! Before, with that cut I had, I couldn't be extravagant with my outfits, because my hair was doing so much! Now that my hair is just simple, natural, I can really express myself with fashion more and you guys will really see that over the next few months. CN Reader: Has your definition of self beauty changed? Yes, it's totally changed, and it's hard for me to admit that because I've always wanted to be able to say, 'being relaxed is the same… I just decided to cut my hair'. But no. I feel more beautiful than I've ever felt, and I feel more honest than I've ever felt in my life. CN Reader: Do you feel as connected to the natural world as much as the natural world has embraced you? I really am, and that's the honest truth! I feel like I am supposed to be like an activist now and although I have many ideas of what I think should happen in the brown skin community- upward mobility, taking advantage of scholarships, and doing what I call 'checking the box'- I'm nervous, you know. A lot of times when I do interviews with my natural sisters, I'm like, oh God, is she gonna ask me what I think about Barack Obama's stance on Medicaid?! I'm afraid. There are a few different schools of beliefs in the online natural hair world. I like to think that Curly Nikki is one of the more tolerant communities. We're not really political. And that's why I appreciate it. I simply feel beautiful when I visit your site. I don't feel like I have to take a stance on anything, I can be myself, and I can be honest. My hair is just curly, and we're all just excited about our hair! CN Reader: I've been a huge fan of Chrisette from day one, and I was super psyched when she came for Spelman's homecoming! I loved seeing her rock her TWA in person, and I would just like to know, "when you look in the mirror every morning, how do you feel about yourself and how does your TWA play into those feelings?" My hand is literally in my head all day. When your hair is relaxed and fixed in a way that needs to be left alone, you don't touch it... no one else is allowed to touch it... your boyfriend can't touch it. Now, everyone is in my hair all the time, and I just feel more free and more open. I'm much more comfortable with people being in my space. I believe that you can see that with my smile when I look in the mirror. CN Reader: Recently, Chrisette criticized Ricky Rozay, more well known as Rick Ross, for walking out of the Soul Train Awards after having lost his category to Eminem. One of the many things she mentioned in her open letter was how surprised and dismayed she was to see that hip hop had become so fickle and immature. She recently did a track with Rick Rozay and although I love her vocals on the track, I don't get why she would work with an artist that is so demeaning and disrespectful towards women. So my questions in regard to her collaboration efforts are: Why do you choose to work with certain artists? And do you consider their image and the content of their music before working with them? Well long story short, because that is a multifaceted question-- when I did tracks with Jeezy, Naz and The Roots, I got to listen to the lyrics before the song came out. I got to listen to the lyrics before I even did the hook, so I was able to write a song or a hook based on what I listened to. When I did my song with Rick Ross, I wrote the hook before anything was on the track. Then he sent the track to Drake, Drake did his version, and then Rick Ross did his lyrics on top of that. The track was then leaked on the internet, and that was before I had agreed to any of the lyrics. The song picked up steam on the internet, and as you guys know, the internet now holds a big place in how our music is placed on the radio. From there, the song went to radio before it was officially made a single by the record label, and became number 26 without any record promotion at all. And that's when I was asked if I was okay with the record. After it was already on the billboard charts. So by this time, it would be kind of crazy of me to pull out. I could have pulled out, and your reader is absolutely right, and I totally validate everything that she said. Some of the lyrics on the song are very confrontational and very demeaning, and it is a little bit scary when I look at the fact that I'm on that record. And it is something that I regret at the end of the day. But, I will say that there is love and positivity needed in every genre of music, and Rick Ross in real life, and in person, is a beautiful human being, and I thought that's who I was working with when we did that record. So, I can't take anything away from him as a person, although there are things that he says that I don't agree with. So yeah, that's the back story, and I totally understand what your reader was saying. CN Reader: Have you had other celebrities talk to you about going natural and caring for natural hair? Whenever we see each other! We're just like everyday girls- 'ooh girl I love your hair, where did you get it done, what products did you use?!' Me and Solange were actually on tour together. When I went out on tour with Maxwell, that's when she cut her hair, and I was like, 'Oh my God, it looks amazing, I'm totally cutting my hair too!' We all talk all the time! 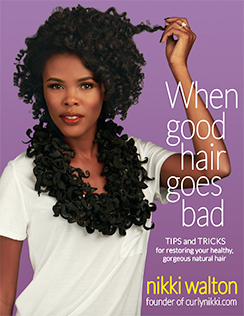 Finally, is there anything you'd like so say to the CurlyNikki community? 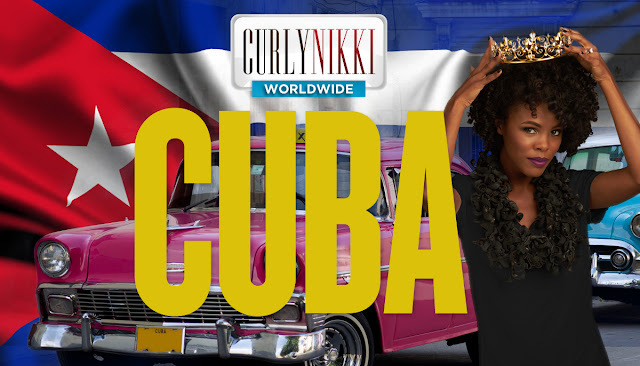 One thing I'm really proud of with the CurlyNikki community especially, is that we celebrate every part of us. It's not just about our hair, it seems like we're a very non-judgmental group of people, a group of people who are really free spirited, and are not taking ourselves too seriously. We don't seem to be an angry group of people, we don't seem to be down on any body else, we're just on the come up! We know that we're beautiful, and we know that there is a place for us in this incredible place we call America. And that's what Let Freedom Reign is really all about. Embracing who you are and finding your niche in this society. And there is a place for us. Keep up with Chrisette on Twitter, or on her official website! And be sure to check out her latest album, Let Freedom Reign, in stores now! OMG! I love Chrisette, thanks for the interview, and I agree that the darker color is beautiful on you. I'll be checking out that Dark&Lovely! great interview Nikki. Chrisette, you're an inspiration to me. I'm big chopping this coming Sunday. I'm scared, but it's time. Wonderful interview! Thank you for sharing this! I <3 Chrisette. Her hair is super cute and she is gorgeous. I really appreciate her answer to the Rick Ross question because I was wondering the same thing. I'm glad she didn't back-pedal and came out and said she regrets doing the song. Good for her for "womaning up" on that. I absolutely adore Ms Michelle! Excellent interview Nikki! Beautiful pictures! I love Chrisette and I love CurlyNikki! Excellent interview as always CN. Thanks Chrisette for keepng it real. She seems really down to earth and I can tell she has a good spirit. I love Chrisette Michelle!!! When I did my BC a lot of people were comparing my look to her and I felt honored. She seems to have a very good spirit and uplifting aura about her and I have the utmost respect for her music and personality. This is why I love Chrisette Michelle. Such a great interview! "Golden" is the song I wanted to be sung at my wedding until the singer backed out. I love Chrisette and I agree with her. CN is my favorite natural hair blog b/c everyone here is so supportive. No one tries to go too "deep" with their comments. You guys have such great tips and it is always about more than just hair. The comments/posts are always so intelligent. she looks absolutely gorgeous! with or WITHOUT hair!!! loved this interview, can't wait for the new album! Omg, speak of the angel! I just listened to the song she featured in 'Shades' with Wale. It is soooo beautiful. People should check it out. Loved this! Thanks so much Nikki and Chrisette! Miss Michele is so real! I truly respect and admire you. Thanks for the interview. 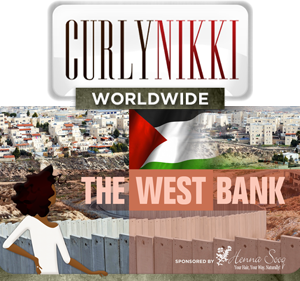 And I agree with what she said about CurlyNikki, this is my favorite blog, just for those reasons! Great interview! She is strikingly beautiful and seems doen to earth. I love her, but to refer to her hair as hard and angry, a better description would be strong hair that has a lot of staying power and character. We need to choose words of love for our hair!!! !